Testimonials | Mrs. Oana Ancuta | Study Bridge Ltd.
Oana is a Romanian Student studying at Kensington College of Business. She was a passionate worker in the medical field. 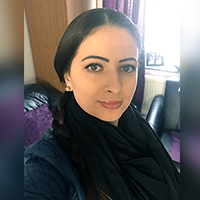 While working as a nurse, she decided to move to UK with her family. She contacted Study Bridge and asked if we are able to enroll her to complete a degree in Business Management. As a mother of a 4 years old son, she was able to attend classes without any hassle. Kensington College of Business provides full time Course where classes are held for two days in a week, which again encourages full time mothers to attend their classes without any difficulties.